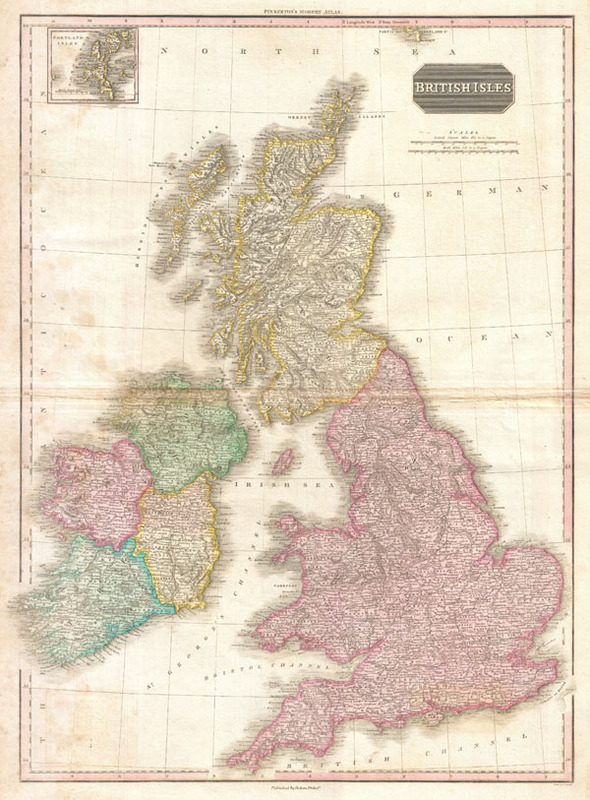 Pinkerton's extraordinary 1818 map of the British Isles. Includes England, Scotland and Ireland. Covers the entire region in considerable detail with political divisions and color coding at the regional level. Identifies cities, towns, castles, important battle sites, castles, swamps, mountains and river ways. Inset of the Shetland Islands in the upper left quadrant. Title plate and two mile scales in the upper right quadrant, British Miles and Irish Miles. Good condition. Mild damp staining in lower quadrants. Original centerfold exhibits some wear and toning. Blank on verso. Rumsey 0732.011. Phillips (Atlases) 724. National Maritime Museum, 409.